Our overriding aim is to provide a rich member experience, accessible from any smart device, on-line, anywhere, Rewarding and encouraging the member to take an active role in his organisation, reliably renew, year after year and encourage new members to join. Membership payment or donations can be processed in real-time provided the merchant account exists. Members have the ability to post Ads onto the site. Options are to have the advert appear as soon as posted or have a moderator grant approval first. In case moderation is required, the moderator will receive an email alert for every new post. They will also see the new ad request when logging into the administrator panel as well as the outstanding approval list. The organisation may negotiate with suppliers regarding special price discounts that may be offered to it’s members. Discounts can be displayed on member logon or via standard email alert. The memberships of most societies or associations can be very attractive to advertisers as it gives them a highly defined vertical market. 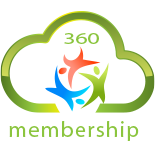 360 MembershipTM administrators may allow third party advertisers to post ads to their members and collect what could be substantial fees. Members can sign up online anytime. The online application form is controlled by the administrator and displays the current fees at the time of signup. Additionally, members can be signed up, invoiced and receipted via a mobile device, thus allowing member recruitment at field days, events and expos. If the organisation so wishes, new (or existing) members may choose to also join other societies or organisations. Often this requires an additional joining or membership fee, thus offering another opportunity for revenues, by a share of these fees. Payment gateway implementation incurs an additional fee, as all sites have different providers and requirements. Coconet has already implemented gateways from all the major vendors, hence little additional work is required if a common gateway is chosen. All features marked as optional may occur an additional fee to implement and execute.